As I've stated many times, my goal is to collect every LI record ever made. And I have most of the non test presses. Which is about 10% of the battle. Many of my friends know this, and they're always keeping their eyes peeled for me. Especially my buddy Brian. He texted me last week saying he was going to record fair in brooklyn after work. I couldn't make it because of emails. Emails are my new ball and chain. 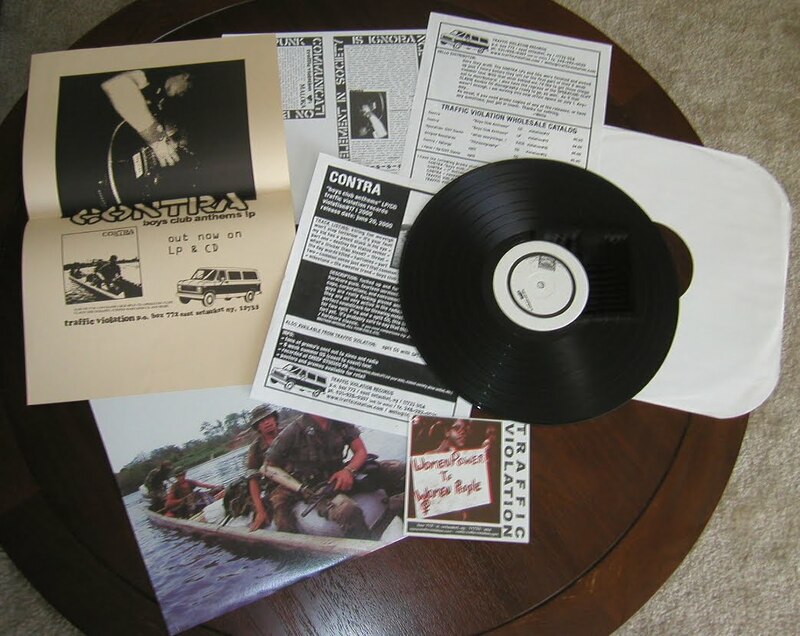 Well later that day Brian sent me another text saying he found the Contra LP off of Traffic Violation on black but their was nothing on the labels. Then he followed this text up with another saying he found the same record with the label printed on. SCORE! I immediately told him to buy that cause it must be the test press. I already had the standard release on black, but no test. In fact I don't have any Traffic Violation records test presses. This was a pretty good sized label back when they were around. They released a lot of cool albums like Latterman and On the Might of Princes. They also hail from Setauket NY, home of the greatest deli on the planet Se-Port Deli. My brother and I have gone to this deli for dinner every friday for the past 7 years. And I've been going every week since 1997. It's one of the few things left from the 90s that I still have. So back to vinyl. BLAMO! Some very cool things to point out about this test is it came with a sleeve. Solid. And it was only 5 bucks! Even nicer. Brian comes through in the clutch. 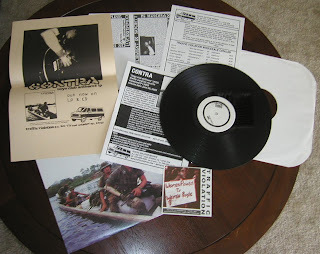 Here's the original release, and all the ridiculous stuff that came inside the sleeve. Yeah I have no idea. Tom - "Contraband? Wasn't that the band Serena was in?" Nick - "yeah but this is the band Contra, not Contraband." Tom - "ohhhhh right gotcha." Hey, this is Wells. I used to do the label that put this record out. Here's some info, in case anyone is interested: The first picture is indeed a test press. My memory is a little foggy, but I think we may have done 50 or so tests to sell on a Contra tour before the proper pressing was done. The second picture looks like it includes a promo poster, along with 2 photocopies that we put together for stores and distros with info on how to order. Those didn't actually come with the regular release. Anyway, pretty neat to see people still interested in Contra. Great band. Thanks for caring.